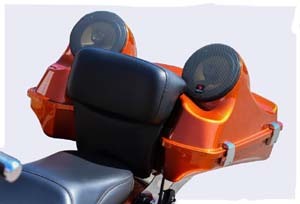 Add rear speakers to your Electra Glide Classic! Tour-pak Lid Integrated Speaker Pods: Offers aggresive styling for increased driver sound. High-quality fiberglass Tour-pad Lid w/Integrated Speaker Pods fit 6.5” speakers for all-around sound. This high quality tour pack lid is carbon fiber reinforced at the hinge and latch mounting locations for added strength and durability. Sold un-finished and ready to be painted. 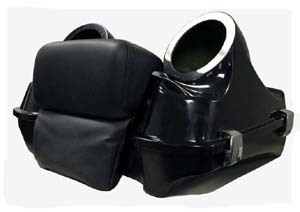 Fits 1997-2013 H-D tour-pak. 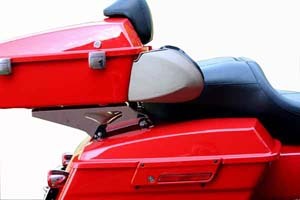 Lid mounts directly to OEM base accepting H-D mounting hardware, latches, hinges, lock, and backrest. 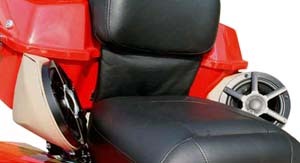 Note that backrest, hardware, and speakers are sold separately. 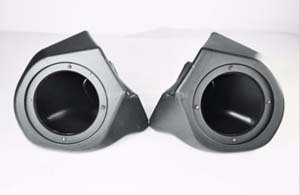 Chopped Tour-pak Speaker Pods: Designed to be able to be installed on the lower profile chopper tour-pak. The Pods accommodate speakers (not included) and are unfinished and ready to paint. Unfinished. They fit all Harley-Davidson "Chopped" Tour Paks. Accepts 6.5" round speakers. Speaker and speaker grills not included. Low Profile Chopped Tour-pak Speaker Pods: Offered in textured look. Scaled down in size but not the quality of sound. 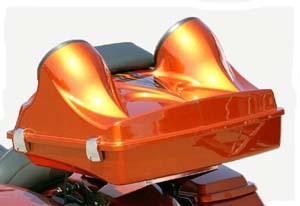 Designed to accent the profile of H-D's popular chopped tour-pak. The Pods accomodate 6.5" speakers (not included) and feature painted in vivd black or covered softdash construction. Unfinished. Tan shown in top photos. 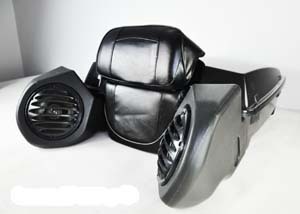 Chopped Speaker Pods fit all Harley-Davidson "Chopped" Tour Paks and will also fit King/Ultra Tour Paks.